Your phpinfo page lets you see key information about your hosting account, such as configuration settings and available variables. And you can use it to troubleshoot issues. 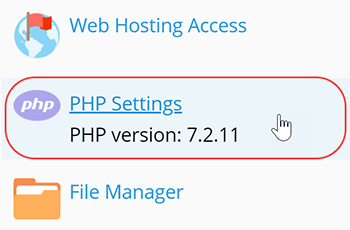 In your Plesk shared hosting account, you can view the PHP info page without uploading a phpinfo script. Click PHP settings under the domain name you are editing. Note: If you do not see PHP Settings, click the option for SHOW MORE. Click View the phpinfo() page to see the page in a new browser tab. You can edit the custom PHP settings as needed.